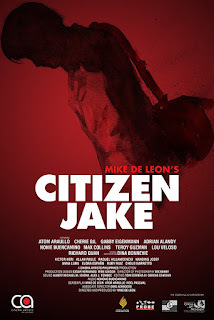 Citizen Jake is a 2018 noir crime drama starring Atom Araullo, Teroy Guzman, Gabby Eigenmann, Adrian Alandy and Max Collins. Other cast members include Cherie Gil, Lou Veloso, Nonie Buencamino, Anna Luna, Allan Paule, Richard Quan, Victor Neri and Dina Bonnevie. It is written, produced and directed by Mike de Leon. It premiered on May 23, 2018. The film is centered around Jake Herrera (Atom Araullo) a journalist and blogger who lives in Baguio City and treats it and the house he lives in a safe haven against the problems of the real world. This arises conflict against his father (Jacobo Herrera) who is a corrupt senator along with his older brother (Gabby Eigenmann) who is also a corrupted congressman as they want to sell the house. Moreover Jake hates the fact that his father and brother are corrupt politicians prompting him to write articles against them and their friends much to the annoyance of his father. Wanting to prove to himself that he is different from his father, this changes however when he tries to solve the murder of a female student from the university he teaches in. The film is Atom Araullo’s acting debut, he also helped with writing the script along with the Director de Leon and another principal writer Noel Pascual. Most notably known as a journalist and TV reporter, Araullo as seen in the trailer channels his inner acting skills in this political drama. This movie is also the director; Mike de Leon’s debut film in 21st century. What is so interesting about this film is the authenticity portrayed by Araullo since he is a real life journalist together with Mike de Leon who is responsible for the 1999’s classic Bayaning 3rd world. This movie team-up sure is interesting to watch on the big screen. Make sure to catch Citizen Jake in cinema’s near you.